Things go bump in the night but not quite as frequently as you might expect in this resolutely restrained, convention-defying take on the ghost story which weaves toxic masculinity into its prim 1940s setting. 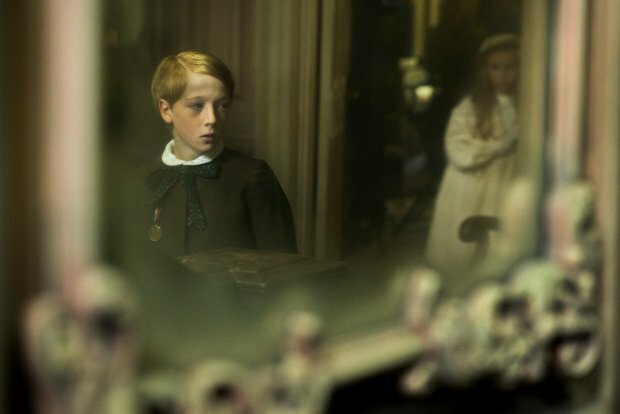 Based on the Booker-shortlisted novel by Sarah Waters, The Little Stranger is directed by Lenny Abrahamson (Room, Frank) and features startling, career-best work from Domhnall Gleeson. Scripted by Lucinda Coxon (The Danish Girl), it follows Warwickshire doctor Faraday (Gleeson) as he befriends impoverished nobles the Ayres, led by Mrs Ayres (Charlotte Rampling). The family reside at the now-crumbling Hundreds Hall – a stately home that left the younger Faraday spellbound as a boy, an obsession he has never really shaken. The medic visits them first in a professional capacity, helping the war-wounded and mentally anguished Roderick (Will Poulter), and later as a suitor, pursuing Caroline (Ruth Wilson). However, his efforts are overshadowed by the appearance of a supernatural presence with apparent links to a family tragedy. It's a film that acts as a superb platform for its actors, with Abrahamson lingering long on reactions and resisting the desire to rev things up dramatically, or simply skip to the scares. Wilson is typically mesmerising – convincing as a sensible country lass, even if the references to her being dowdy are ludicrous. And yet the show is stolen by Gleeson who, little by little, allows us to glimpse the anxieties and growing resentment behind the good doctor's stiff and sensible exterior. If it's a largely faithful adaptation, the film replaces the book's ambiguity with a more explicit assertion of the source of the phenomenon, though the final reveal seems unnecessary. Despite all the trappings of an elegant period piece, it delves deep into the male psyche in a narrative that grapples with romantic entitlement and class tensions. Set against a backdrop of the post-war Labour government's landmark programme of social change, Faraday's misguided glorification of those who look down on him courses through him like poison. Instead of considering himself a triumph of social mobility, his humble origins are a source of self-loathing which rises to the surface as his ties to the Ayres grow stronger. Costume dramas have tended to place the upper-classes on a pedestal; that The Little Stranger critiques this usually unquestioning adulation is to be applauded, even if it's too narratively inert to leave a lasting impression. Those expecting a Woman in Black-style histrionic chiller may also be disappointed but will take some consolation from the clutch of truly haunting performances. Selected release from Fri 21 Sep.
Dr Faraday (Gleeson) returns to Hundreds Hall, which he knew as a boy, to help care for the war-wounded family son (Poulter), but there seems to be a supernatural presence. Gleeson gives a career-best turn as the haunted Faraday but while it’s laudably subtle it’s also narratively inert.